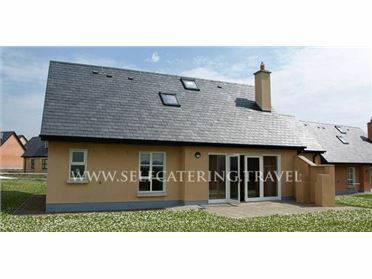 Larkside Cottage is a semi-detached property in a countryside location a couple of miles from the village of Freshford, near Kilkenny in County Kilkenny. The cottage has a double room with en-suite on the ground floor, and a family room with 2 doubles on the first floor. There is a shower room on the ground floor, along with a kitchen with dining area, and a sitting room with electric stove. Outside there is off road parking for two cars, a front patio with furniture and shared gardens. Larkside Cottage is a great base for a couple or family to relax in peace and quiet, or to head out into the beautiful Killenny countryside to explore and make the most of your time in this wonderful part of Ireland. Freshford is an historic village in county Kilkenny, originally the site of a 7th century monastary, now a pleasant base centred around a tree-lined square. The city of Kilkenny is easily reached, and the beautiful countryside of the county is waiting to be explored. Ground floor underfloor heating with electric stove. Electric oven and hob, fridge, freezer, washing machine, dishwasher, TV with Sky, DVD, WiFi, selection of books. Fuel and power inc. in rent. Bed linen and towels inc. in rent. Travel cot and highchair on request. Off road parking for 2 cars. Shared front lawned area. Private front patio with furniture. Two well-behaved pets welcome. Sorry, no smoking. Shop and pub 1.5 miles. Note: Owners' chickens and friendly dogs roam freely around the grounds, dogs to be kept under control at all times. Note: First floor bedroom accessed via steep stairs, room has low ceiling and no door..